Now the enjoyment of roasting marshmallows over a campfire flame can be brought to the comfort of kitchens everywhere! 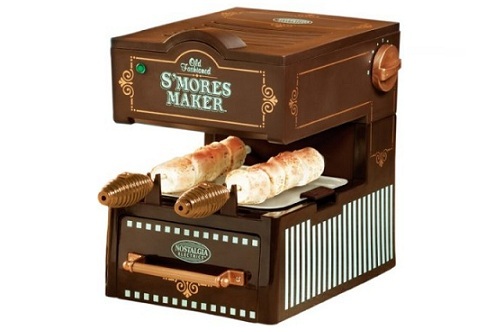 The Old Fashioned S'mores Maker has a charming appeal and roasts up to 9-12 marshmallows at a time. No more splintered fingers or dropping marshmallows in the dirt with this convenient device! Each marshmallow evenly cooks to a crisp golden brown outside, gooey-sweet inside. Add graham crackers and chocolate squares to make a delicious s'mores treat. S'mores are such great conversation starters, and fun desserts for group gatherings, that they've been popping up on restaurant menus across the country. Finally, they can be made anytime, virtually anywhere, in the home.